1. A device such as a metal rod, wire, or strap, for fixing one object to another, as specially formed metal connectors used to fasten together timbers, masonry, trusses, etc. 2. In prestressed concrete, a device to lock the stressed tendon in position so that it will retain its stressed condition. 3. In precast concrete construction, a device used to attach the precast units to the building frame. 4. In slabs on grade, or walls, a device used to fasten to rock or adjacent structures to prevent movement of the slab or wall with respect to the foundation, adjacent structure, or rock. 5. A support which holds one end of a timber fast. 6. A device used to secure a window or doorframe to the building structure; usually adjustable in three dimensions; also see doorframe anchor. 7.See jamb anchor, masonry anchor, etc. 8. The anchor-shaped dart in the egg-and-dart molding; also called anchor dart. 9. A device used in a piping system to secure the piping to a structure; typically provided by a metal insert in an overhead concrete slab or beam. When Gardner arrived on the job site, he realized the importance of removing the existing concrete anchors with safety and care. The ISO 9001 certified Glotman Simpson Group, well-known for its most recent completion of a seismic restraint manual for the Electrical Contractor's Association of British Columbia, is evaluating tests for the patented concrete anchors against industry-standard, seismic design requirements for anchors. 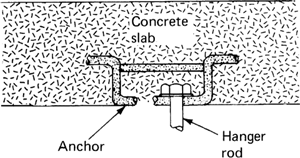 You may have to use a concrete anchor that expands as you tighten the fastener (p.
9 TIP the walls up and drop them over the concrete anchors. holes into the concrete to accept the concrete anchor bolts (Photo 7). Tightening torque: 22 ft-lbs base materials : concrete anchor diameter: 1/2" thread length : 11/16" baseplate clearance hole: 9/16" drilling depth : 2" "hilti" #336432 "wej-it" #wds12, 4,500 each. A two thousand pound (2000lb) concrete anchor block; 2. It can be fixed to the ground with steel or concrete anchors. Prolonged exposure to silica dust while performing tasks such as installing concrete anchors, core drilling for poke-thru devices, and trenching for wireway can be a serious health hazard. Three rows of mammoth concrete anchors weigh the terra-quasi-firma in place.